I have discovered something lately. 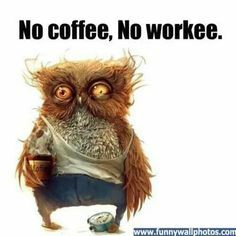 I simply can not stay up late at night anymore without copious amounts of coffee on hand. I have come to the painful, if somewhat obvious conclusion that I may not be as young as I used to be. Of course my other persona is a writer of speculative fiction so I suppose I could always write my way into a world where they have 36 hour days, 10 day weeks and 15 month years! Nah… that wouldn’t work either. I’d just fill that schedule too. Well, if you read my last post, you’ll know that I have decided to throw my hat into the ring again with NaNoWriMo. Yep. I really am certifiable. But then, aren’t most writers? I mean we hear voices in our heads and we talk back – sometimes argue too! Or at least I do. My characters are always doing stuff I tell them not to – I can’t have that, can I? There would be chaos all over. 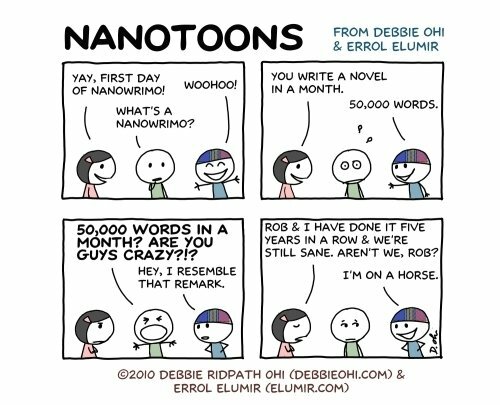 And apparently those of us who participate in NaNoWriMo have just a little extra crazy. Especially once I figured out that most authors write more than 50,000 words in a month. When you count the first draft of a manuscript, edits on the one you turned in three months ago, blog posts, interviews and social media stuff – that’s WAY more than 50,000. So if I’m crazy, I must be absolutely normal! Isn’t it funny how often we writers leave it at “a friend”? I have discovered that “a friend” is usually code for someone who has some pretty incredible news they aren’t ready to share with the rest of the world yet. Every so often it is really code for – they are telling us something deep & dark about themself and it’s not something they may ever be comfortable sharing with the world. And I say writers but I’m certain we’re not the only ones who do that. Anyway, so I was chatting with my friend and it struck me as so odd when she mentioned she was on a vacation from writing. Which made me think – how does a writer take a vacation from who they are? However, like everything else in life, it makes perfect sense really. Like snowflakes, no two people are exactly alike. That means in everything, including why they do something and how they do that something. Years ago I made some decisions about my life and how I was living it. In my bio, I mention that I’ve been writing since I was very young. Well that is true. But…for a very long time, after high school and divorce and doctors telling me I couldn’t have children… the voices went away. For a long time, I couldn’t write anything. In the years since my AMAZING son was born (clearly God had other plans! ), I have finally come back to the place where those stories showed themselves to me again. But I kept writing and I finally realized that God had a plan for my writing. I just wasn’t listening. HE has a plan and it is going to be so much better than absolutely anything I can think of so I am now editing my third book (1st in a new series) and waiting for God to show me His plan! And who knows… maybe some day I will get to the point when I relish a vacation from writing. But I doubt it. Because now that I finally have that part of me back, I feel whole again. I feel real again. I feel sane again (that probably sounds odd since I’ve already admitted that I hear voices). And I hope that I never lose that part of me again. And whether I ever get published, self-publish or just write for me and my family and friends – I am beyond overjoyed to have what I like to think of as my connection with Heaven working again!